The two things that immediately spring to mind when Adam Smith is ever mentioned are “invisible hand” and “division of labor”. But is the concept of “the division of labor”, like labor itself, divisible? Without raising the question about whether it is useful to conceptually divide invisible hands into left or right, it is reasonable to expect that dividing “division of labor” itself into types—including comparatively subtle, different subtypes, such as “synergistic” and “quantitative” (below)—can prove to be quite valuable from an organizational and employee assignment point of view, e.g., improve work efficiency, prevent inefficiency and otherwise optimize allocation of talents. To grasp the diverse meanings of “division of labor”, imagine a company that employs seamstresses, with each one completing, in exactly the same way, a pre-cut dress on a sewing machine, by sewing all and only the seams. To the company’s management, “division of labor” means having many seamstresses dividing up the production quota by identically replicating each others’ task. In the accompanying diagram, this business production model appears as “1-many-1” (1 job-many workers-1 task), the “task” being to identically sew all the seams in one dress, the “job” being to finish pre-cut dresses in preparation for shipment). Yet, in this instance, “division of labor” could have meant something else. With exactly the same number of machines and seamstresses, the division of labor could be further subdivided and conceived differently. For example, one seamstress might sew only the shoulder seams for all dresses, while another sews only the seams along the torso, and a third sews the hems, in a kind of division of labor within a division of labor—a “fractal (or “nested”) division of labor”, so to speak. In this case, “division of labor” means dividing up the production steps, rather than the production quota. Should the labor be 1. divided quantitatively (dividing the job’s quantitative output task identically among multiple workers), 2. divided sequentially or in parallel fashion (the classic Smith kinds of examples–dividing the job into a linear sequence of tasks or parallel, but different, tasks, with no one task being assigned to everyone and some single task being assigned to only one or several workers), or 3. divided synergistically (for example, in team brainstorming to come up with a product design or business plan)? Synergistic division of labor (see figure shown here, resembling a roundtable brainstorming session—a useful mnemonic), although not what immediately springs to mind when thinking of Smith and division of labor, is a legitimate, important and often creativity-promoting/dependent category of the DOL (division of labor). It should be noted that the “synergistic” and “quantitative” forms represent two distinct “1-many-1” DOL patterns (in graphic, at top). The 1-1-1 Division Pattern: Primal? 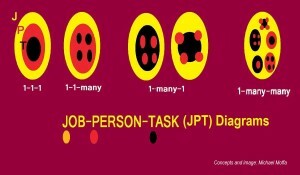 (B) the “1-many-many” JPT pattern: one-job, done by many, working either sequentially or in parallel while performing qualitatively different tasks simultaneously, e.g., 1. many workers testing bicycle chains, while others test the tires; 2. many workers testing chains and testing tires—the job in both instances being bicycle testing. (C) the “1-many-1″ JPT pattern: one job, done by many, who do one task, illustrated above by the examples of creative synergy and the case of creative synergy’s extreme opposite, the many seamstresses doing one job (finishing a pre-cut dress) and one task (sewing all seams). 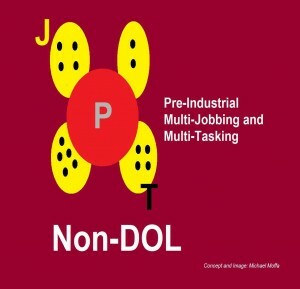 The former “A” many jobs-one person-many tasks model (the “Non-DOL” graphic, here) represents the pure case of no division of labor, and is the most common primitive form of work, e.g., the hunter-gatherer who has to make his own moccasins, sharpen his own arrowheads and find his own berries. “B” is, as indicated above, exemplified by typical modern large-scale assembly lines. So, then what kind of work does the 1-1-1 pattern represent—either (pre)historically or imaginatively? The 1-1-1 Non-DOL Pattern: Myth, or History? The 1-1-1 pattern of one job, one person, one task could have been approximately exemplified by something like this: The early naked and virtuous Adam and Eve, requiring no covering for warmth or modesty, no effort for obtaining food, no shelter to be built, etc., would indeed have not needed to labor in any way whatsoever. That is, not until their “fall” and their fateful apple munching. It is precisely at that point that the possibility, necessity and concept of the 1-1-1 pattern emerged—the moment at which Adam, Eve and all of their descendants were condemned by a vengeful God to forever toil in sweat (shops) and misery. For it was at that point that what—from a logical standpoint and from the perspective of poetic justice—rightfully deserves to be called the world’s oldest, first and most approximately 1-1-1 profession sprang into being (assuming zero or negligible sourcing, processing, promotion and other labor-dividing tasks).